SAKYAMUNI BUDDHA GAO PIECE WITH TARA. SAKYAMUNI BUDDHA IN RED CORAL INSIDE GAO PIECE WITH OHM INSCRIPTION AT BACK SIDE OF COVER. Product no. BUD001 is a finely carved, hand made Gao with Sakyamuni Buddha idol in red coral inside. A Gao is a tibetan style prayer box which holds a spiritual deity inside. Buddha Sakyamuni is seated on a turquoise lotus seat in a gold plated gao, intricately hand carved by buddhist artist. 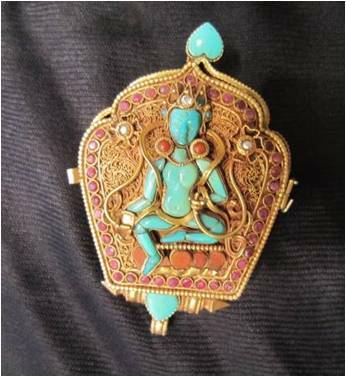 The Front Cover has a Green Tara idol completely in semi-precious turquoise studded with red coral all around the border. The inside of the front cover has hand carved ohm inscriptions in three different scripts. 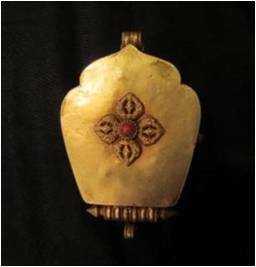 The Back side has a tibetan vajra specially hand crafted by buddhist artist with a red coral embedded at the center. Two heart shaped turquoise stones are set at the top and the bottom. The Green Tara is the Buddhist Goddess of Prosperity and Wealth. A Vajra is a buddhist prayer instrument representing spiritual power. 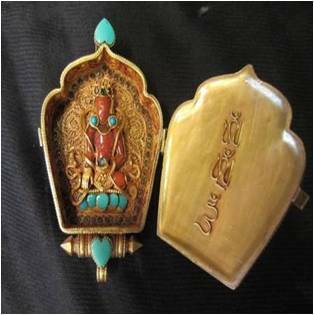 The Gao item can be hand carried or used as a pendant or even placed in your Buddha corner for well-being. GREEN TARA IN TURQUOISE ON FRONT COVER FOR PROSPERITY AND WEALTH. Length: 02 inches, Breadth: 02 inches.